When it comes to making IoT easy, it’s hard to ignore Thingy:52. Not only is the name catchy, it’s also appropriate. It can be anything you want it to be, and you don’t need to be a coder or an expert in RF firmware development to make it so. For anyone interested in developing solutions around the IoT, the problem isn’t a lack of ideas, it’s the fast development and testing of those ideas. This “friction” between concept and reality is what Thingy:52 was designed to minimize. 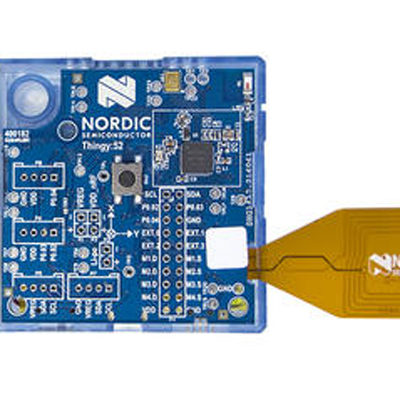 Introduced at CES Asia in early June by Nordic Semiconductor, Thingy:52 is a multi-sensor, low-power development kit based on the company’s nRF528232 Bluetooth 5 system-on-chip (SoC) IC. The IC integrates the RF components and supports Bluetooth low energy, with hardware support for Bluetooth 5, including high throughput and advertising extensions. The flexibility of the Thingy:52 development kit starts with SoC, which also supports protocols such as ANT and any proprietary protocol you may need. Proprietary protocols have the advantage of being more fully optimized for power, if you have a design team and the time for that at some point down the road. It also helps ensure “security through obscurity” if that’s what you need. However, proprietary also means not being interoperable with other solutions. That’s the big trade-off, but it’s not a decision that has to be made in the context of the Thingy:52 dev kit. The kit is all about getting an idea up and working for proof of concept and experimentation. Thingy:52 comes in a 6 x 6 cm plastic and rubber case. Within that case is a board with the SoC, surrounded by a multitude of sensors, including 9-axis of motion (accelerometer, gyroscope and compass), temperature, humidity, air quality, color and light. It has speakers for playing pre-stored samples, tones or sound streamed over Bluetooth low energy (8-bit, 8 kHz LoFi), a microphone and a configurable RGB LED and button. A USB interface allows a physical comms connection, and also recharges the on-board Li-ion battery. These are the hardware elements that give you most, if not all, the inputs, outputs, sensors and interfaces you need. However, it’s the software and app support that’s particularly interesting about the Thingy:52. The app lets developers configure and interact with the Thingy out-of-the box, and it can also be used as a reference for your own app design. Using the Bluetooth applications programming interface (API), the Thingy sensors and on/off functions can be configured over-the-air from a smartphone with the app, so the demo can be up and running without actually having to program the device. Just adjust the settings: all source code and firmware are preloaded. Also preloaded is support for IF This Then That (IFTTT)-based cloud services, which is already popular with IoT-based devices in any Home Depot or Lowes store, such as Philips Hue and Belkin WeMo. Along with app support for iOS and Android, Thingy:52 also includes IFTTT support for short-message cloud connectivity. (Image source: CNET). As attractive as this simplicity may be, once an idea is shown to work, it’s time to get serious and optimize it for the target application. That’s the other aspect of Thingy:52 that makes it a good place to start “ideating.” It fully supports apps development with CocaoPad in Swift 3.0 for iOS 8.0 and above, as well as an Android Library on GitHub. Those libraries are exclusive to Thingy:52, for frictionless development. For web app developers, Nordic also has you covered. It has a reference web app made with Polymer using the Web Bluetooth API. And if you’re ready to get into development and refinement of the application, the firmware for Thingy:52 is downloadable. As many have found to their frustration, it takes a lot of work to make something complex easy to use. It’s also often difficult to think of a name for it, once it’s ready. Maybe “Thingy:52” was a working title for the project as Nordic set about developing it and they just couldn’t think of something else to call it. Or maybe, and more likely, the team recognized that it was such a useful and flexible idea development aid for next-generation IoT solutions that giving it a formal name would have overly defined it. Better to keep it free from preconceptions and let IoT solution providers do the defining. You can get hold of the Thingy:52 here.